The fascination with the mysteries of human development goes back far into human history. This course studies the major theorists, researchers and schools of thought that have contributed to our attempts to unravel and understand the mysteries of how and why human beings develop into the people they become, with the multitude of capacities and subtle nuances of being human. The student will have the opportunity to study, as well as to apply the knowledge of developmental psychologists through class discussion and a major class project applying the material we examine to a self-study and developmental analysis project. 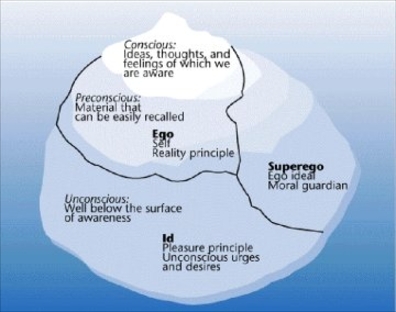 No, this is not your brain on drugs, rather it is your mind according to Freud. 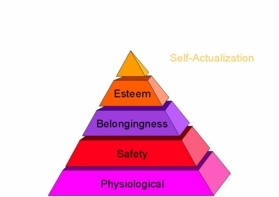 We will study his theories of personality development as well as many others, including the humanistic theory of Abraham Maslow, whose notion of the Hierarchy of Needs is depicted above right. We will also examine findings from laboratory research, as well as following a group of children from age 7 to 56. I can be reached by email at rb@vorlon1.com. Email me. while imagination embraces the entire world." Students wishing to chat may use the chatroom. Click below.